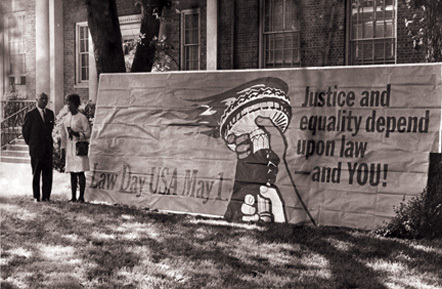 This photograph shows a Law Day banner displayed outside the North Carolina Central University School of Law. Next to the banner is Mrs. Johnnie W. Brown, an administrative assistant with the school. Law Day was established in 1958 by President Eisenhower as “a day of national dedication to the principles of government under law.” The day is still observed at North Carolina Central University with a Law Day banquet.